Rock Boring Urchins come in different colors, consume complex algae, including calcified algae. They have sharp spines, which can give you a sting comparable to a bee sting if the spine pierces your skin. 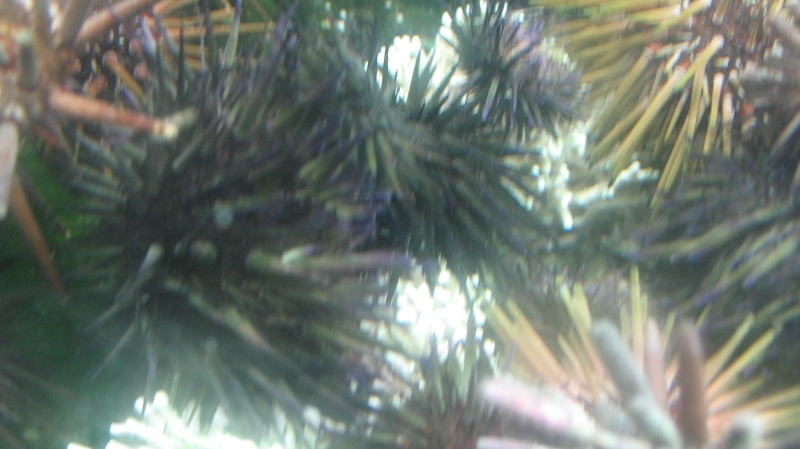 Using its spines as protection, urchins can be used in tanks with predatory fish, that would otherwise eat snails such as puffers. Rock Boring Urchins come in different colors, consume complex algae, including calcified algae. They have sharp spines, which can give you a sting comparable to a bee sting if the spine pierces your skin. Take care to not squeeze them too hard when handling them. They grow to about 3 inches in diameter, with spines reaching out 1-2 inches. These small urchins are young, and are about 1 inch in diameter total size. They devour algae, including desirable algae and are not marine planted tank safe, they are reef safe though. They should be given plenty of live rock to graze on, and should be kept in tanks over 30 gallons. They can/will scratch acrylic.